In this paragraph you will find the exhaustive information about the assemblage of home-based electrocardiograph. You can do it yourself instead of spending your money on buying an expensive medical device. If you can handle the assemblage you'll be able to record, view and save ECG signals by means of this device. As result, you'll get far more information about your heart state. Moreover, having assembled your own electrocardiograph, you'll become independent of cardiologist's consulting room working. You'll be able to record your ECG anywhere and whenever you want. Such a possibility is really important for many chronic and acute medical conditions. I guarantee the fact that you see the latest, most tested and most perfect version of our device. It works without a hitch with all the computers we have and all the "patients" we've met (I mean, our friends, colleagues). The FT232RL is used to convert a USB to serial UART interface. This microchip possesses the advanced features in comparison with the other USB-UART converters. Due to it stable device working was ensured for all versions of Windows (XP & 7 x86 & x64). The power supply unit is implemented with the use of the TL494 device which is a PWM (pulse-width- modulation) Power-Control Circuitry. Due to its excellent characteristics we succeeded in noise suppression and increasing the efficiency of the converter. The design of the board is very accurate with relation to noise pick-up and the parasitic interference of signals. It's really easily to assemble the board due to the convenient arrangement of electronic components. 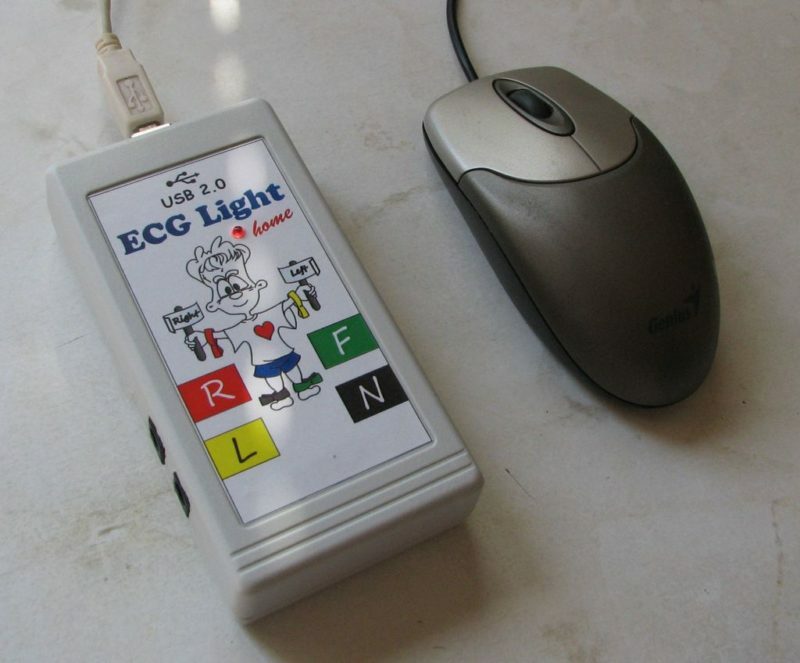 It's necessary to use ECG Control v.1.2 (and subsequent versions) with this hardware. Because the earlier versions of software works under other firmware. You can download the schematic circuit and everything required for assembling the device at home here. There are the schematic circuit and the top and bottom sides of the printed circuit board which are prepared for printing (in PDF format) in the archive. Bear in mind that you should print the images of the circuit board sides without any changes! Print the images on a 1:1 scale without shifting and mirroring. In the archive you'll also find the map of the arrangement of electronic components. You can learn how to make a PCB at home here (thermotransfer method with a laser printer and iron) and here (creating Printed Circuit Boards with a inkjet printer). Let me explain to you a few significant aspects which are should be taken into account while making your first electrocardiograph. The electrocardiograph is supplied from PC by an USB cable. The device has the pulsed high-frequency transformer converter of power supply which provides galvanic isolation of biopotential amplifier circuits and power supply circuits. Such a converter guarantees the electrical safety of the device and stable power supply for the measuring amplifiers (bidirectional +5V and -5V) and microcontroller (unidirectional +5V). "The smartest job" is accomplished by the excellent chip TL 494, whose an electrical load is the primary transformer winding. It works in a push-pull mode. The feedback loop which provides for stable output voltages is performed through an optocoupler (TLP281GB). Bear in mind that this chip must work under the minimal supply voltage 7 V according to its data-sheet. But its minimal supply voltage turned out to be 3 V. Surely, its reference voltage source doesn't work quite correctly, but nevertheless this fact plays no role in our case of its connection. But the producer of the chip TL494 is crucial. You should buy the chips from Texas Instruments (TI), because they don't have the security circuit which is put in case a supply voltage declines. The chips from Motorola doesn't work at the 5 V power supply (it has such a blocking function), and the device won't operate at all. Pay more attention to making the transformer. You should buy only Epcos transformer cores if you have such an opportunity (Epcos is a manufacturer of electronic components, modules and systems in Germany ). The full name of transformer component parts (a core, coil former, yoke) is noted on the schematic circuit. You can download the data sheet of the transformer core here. Keep in mind that galvanic isolation which is based on the transformer prevents accidental current from reaching ground through a person's body. It means that if you wind your transformer in a slipshod manner you may get an electric shock. At first wind the primary winding of the transformer, watching carefully that the wire is uniformly distributed along the coil former. 40 winds must be wound along the coil former. The wire thickness doesn't matter in our case. We usually use 0.1 mm for it. You should isolate the primary winding from the secondary using an insulating tape, over which the 70 winds of the secondary winding must be wound. Cover the winding with a few layers of an insulating tape to prevent a mechanical failure. Assemble all the parts of the transformer (a core and yoke). Keep in mind that the core must fit into the transformer freely without effort. If this is not the case then you wound the transformer carelessly and you should recast it. The USB-USART converter FT232RL is the digital part of the device. It's connected to the microcontroller ATMega48 through the optocoupler 6N137. It communicates to the microcontroller at 0.5 megabits per second. You may not assemble the electronic components R46, R47 and VD10. They are needed for data communication control. By the way, the packages of all the components used in the cardiograph are 0805. That's why it's quite convenient to solder them. The socket for in-circuit programming X2 matches the cable of the branded chip programmer Atmel STK-500. Before soldering the microcontroller, it is worth rechecking that it is located correctly and all the nets under the chip are intact. It is very difficult to unsolder any chip without a hot air gun. Moreover, you should avoid overheating chips, because it can result in damage to the pins of a chip. The bipolar limb leads II and III are amplified by the biopotential amplifier built upon the operational amplifiers DA4.The circuit's gain is about 500. A driven right leg circuit is built upon the amplifier DA2. This classic circuit is used for interference reduction. All the other leads (I, aVR, aVL, aVF) are calculated using the II and III limb leads. The security circuit (VD5, VD6, VD7, VD8) provides the stable work of the electrocardiograph under any manipulation you can make (almost any 🙂 ). Bear in mind that all the values of the components which belong to the biopotential amplifier are crucial. None of them (resistance or capacitance value) can be neglected, because the software ECG Control is calibrated for the correct operation with such the values of all the components. Electrodes should be connected to the device using a shielded wire. It helps to reduce the amount of lighting interference. The central conductor of a cable must be connected to an electrode and the central pin of a socket. The copper shield of it must be connected to the second pin of a socket without connecting to the electrode. Ag/AgCl clamp limb electrodes should be used for measuring ECG signals. Nickel and stainless steel electrodes with contact pad area of 4 square cm suit for the electrocardiograph too. It is advisable to moisten the place of the location of an electrode. It helps to get the better quality of an ECG signal. Keep in mind that there are no unnecessary components or via holes. Even if you don't understand how much it matters it is better for you to make your device in accordance with the circuit. The biopotential amplifier has very high input sensitivity, which result in increase in the noise level of a signal if there are some mistakes in the circuit. After having assembled your device, you need to program the circuit. You can download the firmware for the electrocardiograph here. 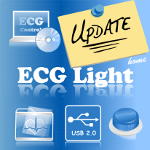 This firmware works with the software ECG Control v.2.03 (and subsequent versions). A chip programmer and Atmel AVR Studio are also needed. You can download Atmel AVR Studio from its official website. Set the options of programming like we show on sceenshots below. I wish you success in assembling your first home electrocardiograph!